I buy our cabbage in very large bags from a membership warehouse as we tend to eat cabbage in many different dishes and it's really affordable! However I sometimes 'need' to hurry and use up the last portion of the bag before it starts to go bad. Typically a great go-to for this is to whip up some cole slaw (yum!) but sometimes I do different things like my favorite cabbage and bacon dish, or even just steamed with butter, salt and pepper. 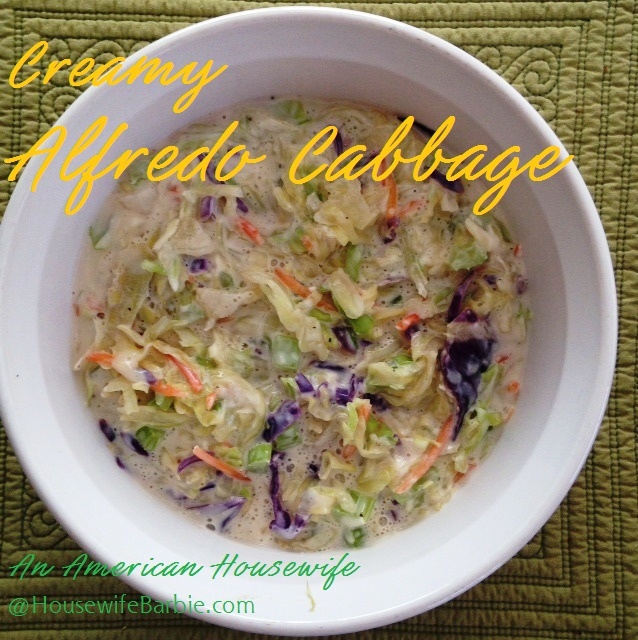 Other times it's this alfredo version - a simple white sauce with the addition of cheese over tender cabbage and celery. I can eat the whole thing myself! And if you already have a jar of alfredo sauce on hand, you can just use that in place of the butter, cream, garlic and Parmesan - that makes this SUPER FAST if you need it ASAP for a dinner side dish. In a microwave safe bowl, place the cabbage and finely diced celery. Add about 2-3 T water and cook about 6 minutes just to soften. Drain. In a saucepan, melt the butter over medium low (do not let it brown) add the garlic, cream, Parmesan and cream cheese. Stir just until cream cheese is melted. Pour over the cabbage mixture and season to taste. You can serve as is or if you have another item baking, pop it into the oven to warm through until the meal is ready. *If you have a jar of store bought Alfredo sauce on hand you can forgo the butter, cream, Parmsean and garlic and just use 2/3 cup of alfredo sauce mixed with cream cheese as a quick version.